Tired of scrambling to find a decent place to live in Canmore? Perpetually Affordable Housing is for people who live and/or work in Canmore. It brings home ownership within reach and provides affordable rental options to eligible residents. 10. As of June 1 2018 CCHC will only accept 2017 Tax Noti­ce of As­sessment for both Own and Rent Prog­rams. /june-1-2018-cchc-only-accepts-2017-tax-notice-as­sessment.. The web server with the IP-address 192.185.225.143 used by Canmorehousing.ca is owned by Unified Layer and is located in Houston, USA. 33 other websites are located on this web server. Most of them are provided in the english language. 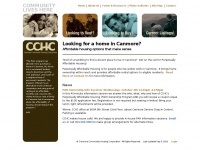 The websites of Canmorehousing.ca are hosted by a Nginx server and were developed in the programming language PHP. The content management system Drupal in the version 7 is used. The markup language of the website is XHTML+RDFa 1.0. The visitor analysis software Google Analytics is used to analyze the visitors of the websites. The website does not specify details about the inclusion of its content in search engines. For this reason the content will be included by search engines.